New Delhi, June 16: India has always believed in ‘Unity in Diversity’ and with this, the people in the country celebrate each and every festival with the same traditional fervor and gaiety across the country. Today on the occasion of Eid-ul-Fitr, let us all come together and celebrate this auspicious day with contentment and love of brotherhood. Eid al-Fitr that marks the end of Ramadan is the Islamic holy month of fasting. 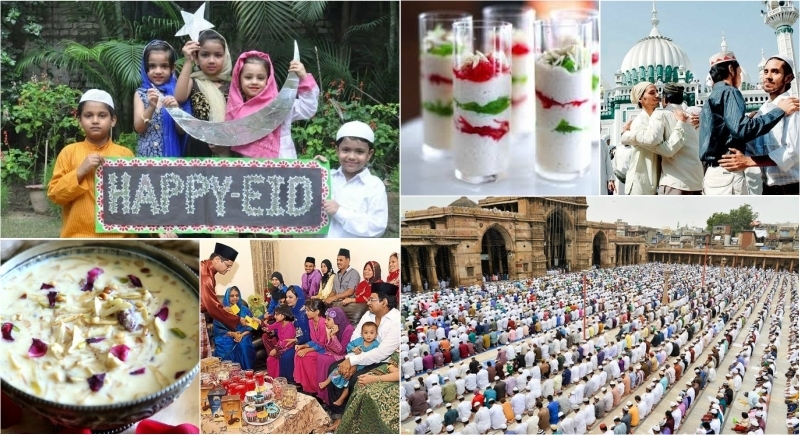 As the whole world will celebrate Eid al-Fitr with all their glee today, Muslims in India will also observe massive celebrations as well. The word ‘Ramadan’ arrives from the Arabic word ‘ramida’ or ‘ar-ramad’ which means scorching heat or dryness. Legend has it that the holy book of Quran was written during this month. Thus, people practice fasting and purify their souls and seek forgiveness from the Almighty Allah. In Delhi, main Eid congregations are being held at Jama Masjid, Fatehpuri Masjid, and Eidgah. Elaborate security arrangements have been made for the occasion. After the prayers, people visit neighbors, family members, friends and to get together to share sweets, snacks and special meals including some special dishes that are prepared specifically on the occasion. Prayers will be offered at different times at every Mosque and Eidgah. Renowned and historical mosques have been decorated nicely and elaborate security arrangements have been made across the state. Members from other communities are also thronged to great Muslim brothers on the festival. Elaborate security arrangements are in place across the state to ensure peaceful celebration of the festival. Marking this day, Prime Minister Narendra Modi extended his warm wishes as "Eid Mubarak! May this day deepen the bonds of unity and harmony in our society", the Prime Minister said. The Vice President of India, M. Venkaiah Naidu has greeted the people on the joyous occasion of Id-ul-Fitr. In a message, he said that Id-ul-Fitr marks the culmination of the holy month of Ramzan and signifies the traditional expression of brotherhood and understanding between people. May this festival bring peace, harmony, and prosperity in our country, he added. Apart from this various other ministers also wished the masses a day full of joy, peace, harmony, and brotherhood.